It’s that time of year again — March Madness, the exciting NCAA tournament. I always had fun watching college basketball; it seemed so much more exciting than the NBA (non-Jordan-Pippen-Rodman era). Playing basketball in jr. high all the way through high school, it’s a game I understand and greatly enjoy. It has been many years since I have actually played a real game of basketball, but I long to run up and down a court, playing close D and making steals. College basketball is a game of skill, fundamentals, and talent. It’s not about fancy moves and players showing off; of course that does happen, but it’s not a huge part of the game. All that being said, it’s been years since I’ve actually sat down and watched a full college basketball game. In fact, the only time I watch basketball now is when the Bulls are on (can you really get enough of D Rose? ), and I really only watch a few (thankfully, I get texts about the Bulls so I know exactly when they win or lose even if I miss the game). I am quite a busy person, so I don’t sit down in front of the TV much, and while I still think college basketball is exciting, my interest in watching has dwindled. I remember the pleasure of filling out a tournament bracket, carelessly choosing which upsets would occur and carefully picking the safe bets. It doesn’t really matter how much basketball you watch or how much knowledge of each team you have, anything can happen during March Madness, and that’s what makes it beautiful. For the first time in a few years I have filled out a bracket; I thank a coworker for that! He eagerly created a pool where we each donate $5 and whoever wins gets to donate the money to the charity of his/her choice. Sounds good to me! I delighted in picking which team would win each game. I had to base my choices, as I usually do, on past performances (and I mean way in the past) and the teams I like. No matter how good Duke is, I refuse to ever write them down as the national champion simply because I don’t like them. My brackets are often fairly terrible, and I am expecting the same this year, but I am also expecting lots of surprises and I hope my bracket captures them! 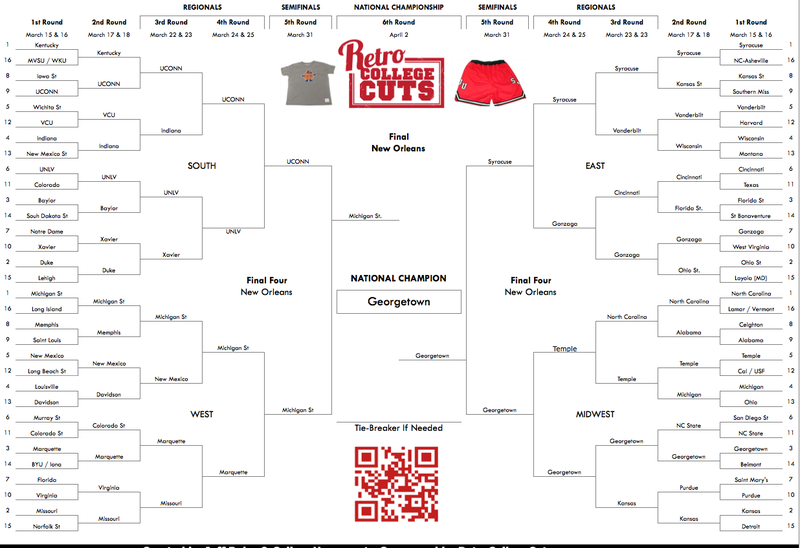 Check out my bracket below and smile or laugh…or squint…or cringe, even. Apparently, my national champion pick is quite a bad one, but I have my hopes that Georgetown can take it all away. Anything can happen and I’ll see you at the end of it all on April 2nd.